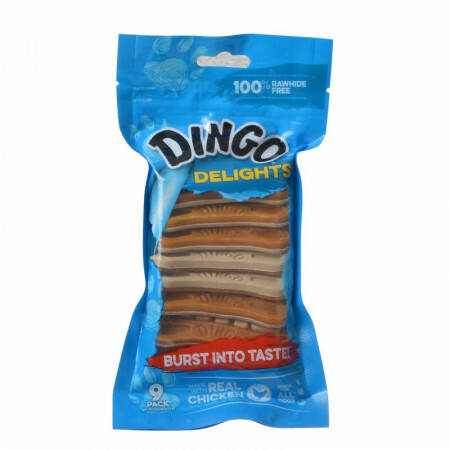 Dingo Delights 2-in-1 dog treats provide double the benefits of normal chews! 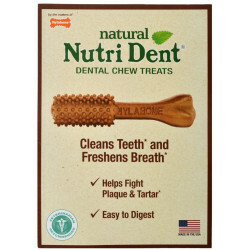 Each bone-shaped treat features two sides: one is soft and chewy with real chicken flavor, and the other has a tough texture that helps clean teeth and remove tartar. And to top it off, Dingo Delights are 100% rawhide-free to aid digestion. 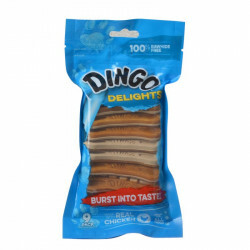 Formerly Dingo Doubles 2-in-1 Dog Treats - now not made in China! 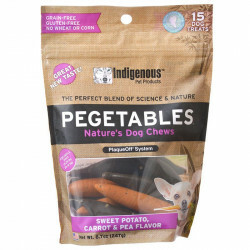 Ingredients: Wheat Gluten, Glycerin, Glutinous Rice Flour, Modified Starch, Pineapple Fiber, Gelatin, Natural Chicken Liver Flavor, Cheddar Cheese, Palm Oil, Calcium Carbonate, Natural Smoked Bacon Flavor, Fructo-Oligosaccharide, Titanium Dioxide (Color), Sodium Propionate (Preservative), Food Grade Coloring (FD&C Yellow 6, FD&C Red 40, FD&C Yellow 5, FD&C Blue 1), Bromelain Enzymes, Alpha-Tocopheryl Acetate.